I remember an incident that happened at an old job I worked at years ago. One morning, we were all working just like we would on any other weekday. Suddenly, the fire alarm started blaring. It was so loud, it pierced my ears. Everyone in the building moved down the stairs, eager to escape the excessively loud alarm. I did not see any smoke or fire. We crowded the parking lot as the fire engines moved in to investigate. After 30 minutes, we entered the building, not sure of what happened. Everyone assumed it was an unannounced fire drill to test our reflexes. Gossip started spreading amongst ourselves about the fire alarm. The building we worked in required key card access to enter any area. In order to exit, a button needed to be pressed to unlock the door. The exit button was next to the fire alarm. The fire alarms were locked with a small glass rod to prevent accidental trigger. From what I heard at the time, a new employee on her first day was trying to exit a room. She was not aware of the exit buttons and pulled on the door repeatedly. Someone was about to walk towards her and tell her to press the red button. She suddenly pulled the fire alarm, breaking the glass rod, triggering the alarm, unlocking all the doors. Later on in the afternoon, a meeting was arranged to explain what happened. One of the managers describe what happened, confirming the gossip. People were laughing and one person whispered “How do you not know the difference between the exit button and fire alarm?” The girl who pulled the fire alarm was in the meeting room. The manager explained how to use the exit buttons and to avoid pulling the fire alarm unless there is a fire. People continued to smile and laugh while this was being explained. The manager would go to explain that the company lost over an hour of productivity and the money wasted from this incident. After the meeting ended, we stood up and went back to work. The girl who pulled the fire alarm approached the door; someone coughed loudly and pointed at the exit button, staring at her awkwardly. People were laughing and smiling as this happened. Even after the meeting, people still gossiped and referred to her as the “Fire Alarm Girl”. I can’t remember her real name. As the week progressed, people stared at her every time she pressed the exit button to leave a room. Sometimes people shouted “Don’t pull the fire alarm!”. There was an unrelated incident where she wanted to print a single page from a document. Unfortunately, she did not specify which page to print and over 500 color pages were printed, wasting the expensive print cartridges, which we did not have replacements for. We placed an order for new ones and people continued laughing behind her back and calling her names. After her first week, she left the company without notice. There were a few theories about this; either she was fired for pulling the fire alarm (which is an offense in Canada) or she decided to quit. I never laughed at her nor did I continue to spread gossip. I never bothered to speak to her either and I can’t say that I made the effort to help her with the embarrassment. I remained quiet about the situation and after she left, people continued to gossip and speculated to why she left. What would I have said to her? The gossip started to dissipate after we replaced our printer cartridges. With the recession making success even more difficult, it can become too easy to turn against someone and laugh at someone for something that can seem mind-boggling. I don’t believe people were respectful about this incident and for this week, we were behaving like school children with casual business clothes. At the time, I was still a new employee; I was working there long before she started. It was a very friendly work environment and we all got along with one another. I don’t believe I could have made a difference if I interrupted people mocking her and stating “that’s not funny” and “show some respect”. The managers laughed at her too. 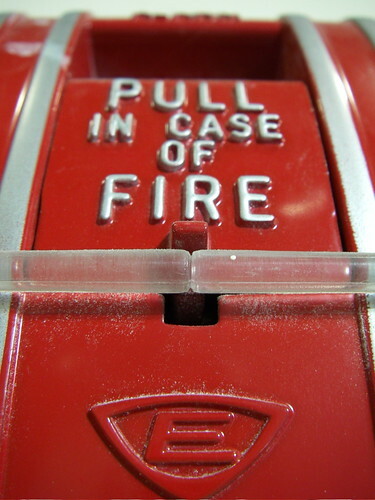 What if someone else pulled the fire alarm: A manager? Me? You? She barely had a chance to prove herself to the company and I can’t say that anyone evaluated her skills and experience fairly. What if she simply ignored everything and continued working like everyone else? Would she eventually achieve success at another company? “It only takes a few seconds to leave a first impression. It can take years to recover from a bad one.” That’s what I was told back in my high school co-op days. I can’t say I would have made the same mistake; it’s possible she may have been new to the country and not familiar with fire alarms. I admit the story is laughable and I feel that some people ridiculed her too much about it. There’s no way to guarantee a perfect positive impression. Sometimes we blunder and the only thing we can do is bite the bullet, hope it blows over and show everyone that we are capable of greatness.